Country’s leading business conglomerate Bashunadhara group has initiated their new voyage on food and beverage arena inaugurating ‘Bashundhara Food and Beverage Industries Ltd.’ on Friday. Bashunadhara Group Chairman Ahmed Akbar Sobhan inaugurated the new industrial initiatives at Bashundhara Convention Centre in the evening. Managing Director Sayem Sobhan, Additional Managing Director Safwan Sobhan and high officials of the group also attended the inauguration ceremony. The inauguration ceremony started with a vivid decoration in the convention center and adjacent areas with a remarkable glimpse over farmhouse and farming culture to mark the food as one of the culture of Bengali tradition. The convention center was turned up with a green view as like as village and a light fall was pouring down vividly while countries eminent industrialist Ahmed Akbar Sobhan inaugurated the new concern. 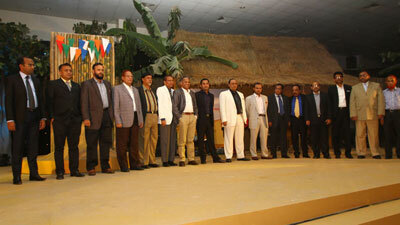 Later, a magnificent cultural show was staged and Bashundhara Foods and Beverages were served among guests and spectators. The Bashundhara Group started its operation as a real estate venture known as “Bashundhara” under the aegis of the Group’s first concern – the East West Property Development (Pvt) Ltd in 1987 with the slogan “For the people, for the country”. Driven by the ramifications of this success, Bashundhara geared up to invest in new fields, including manufacturing and trading. More enterprises were established in the early 1990s, covering diverse activities involving the production of cement, paper and pulp, tissue paper, steel, LP Gas bottling and distribution, and a trading company, among others. The Group’s first publicly-traded company, the Meghna Cement Mills Limited, is currently listed in the two Stock Exchanges of Bangladesh. The Group now has over 20 major concerns located in different parts of the country. The multi-faceted shopping mall and recreation centre called the “Bashundhara City” has added glamour to the growth of the group. 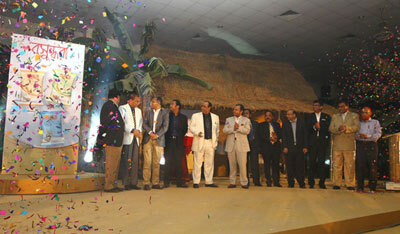 East West Media Group Ltd is the mass media enterprise of the Bashundhara Group that was established in 2009. The media house is also planning to launch a FM radio and a television channel soon. Most of its projects have been success stories – this fact alone is enough to justify a sense of confidence in the Group’s future.